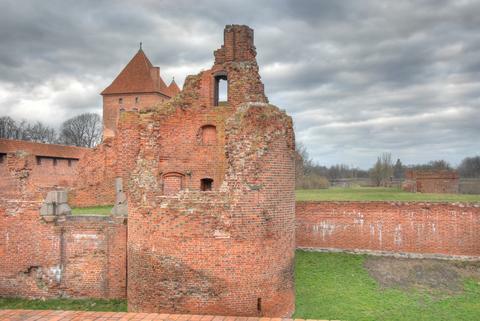 In 1280, victorious Teutonic Crusaders began building the world’s largest castle on a hill overlooking the River Nogat in what is now northern Poland. Malbork Castle became the hub of a powerful Teutonic state that crushed its pagan enemies and helped remake Medieval Europe. Now, ancient pollen samples show that in addition to converting heathens to Christians, the Crusaders also converted vast swathes of Medieval forests to farmlands. In the early-13th century, Prussian tribes living in the south-eastern Baltic became a thorn in the side of the Monastic State of Teutonic Knights, which was formed in 1224 in what is now Germany and Poland. To remove the thorn, and protect Christian converts in the region, the Teutonic Order launched a series of crusades. By the 14th century, the conquests had produced a state that ruled over more than 220,000 people, Alex Brown and Aleks Pluskowski of the University of Reading in the United Kingdom report in the Journal of Archeological Science, including new colonists who settled into fortified towns and castles. To understand how these historic shifts changed Europe’s environment, past researchers have relied on hints from old maps and papers, such as those showing how much timber or stone a wealthy Knight used to build his castle. Brown and Pluskowski, however, turned to a different kind of historical record: the pollen grains that become trapped in the layers of mud that line waterbodies. By analyzing shifts in the pollen, researchers can reconstruct everything from past climates to landscape changes.